ur unique publications and recordings can rarely be found in common stores due to their non-commercial nature and our attitude towards the big world. These releases are however available from the Country Home mailing service. Martin’s books, CDs and DVDs are first-class products of the original „cottage industry“ and appear in limited volumes. If you like them we gladly encourage you to recommend them to your friends and acquaintances. 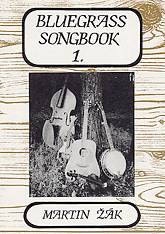 This Songbook includes 99 traditional American songs in English with guitar chords and tips for original recordings. Several chapters of the book will guide you through how you can play these songs with guitar, mandolin, mountain dulcimer, autoharp and fiddle (these chapters in Czech language). You will also get a CD with clips of all 99 songs. 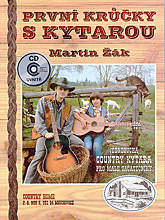 The CD was recorded by Martin Žák himself and an excellent singer of American songs Petr Vacek. The songbook’s nostalgic atmosphere of old times is also based on many period illustrations. A must-have guide through traditional American music. An excellent tool for bands. „I’d like to bring you several dozens of stories sung by plain people from behind the Atlantic ocean (from America) in times of first settlements. They sang them in their homes, farms, schools and churches, on horseback or behind their ploughs, in their free time or during work – anywhere and anytime. The poorer the people were, the more wealth they had in their songs. They did not want to entertain somebody else in those days, they just wanted to satisfy their own needs. 60 period songs that wrote the history of the music of old American country-side (known nowadays as country music) with Czech lyrics written by the author and interesting historical information. The book is framed with a true story of an escape from a big city to a place called the “End of the World” and includes both new and long-forgotten stories. All is supplemented with a bounty of pictures, illustrations and number of enchanting old-time engravings. 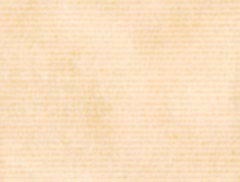 Remarkable and comprehensive collection devoted to the poetic instrument – five-string banjo and traditional country music. The author leads us in distant lands and long-forgotten times. 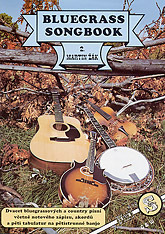 This book accompanied with a CD also serves as summary of playing styles from the original „stroke style“ to contemporary bluegrass „picking“; the book includes tabs for your own playing and a lot of old-time songs. The author also introduces us to some of the best contemporary players of American old-time music, such as David Holt, Wayne Erbsen, Mike Seeger, Phil Rosenthal, Laura Boosinger, Bob Flesher, LeRoy Troy, Michael J. Miles and many many more. You will also be able to learn from experience of Marko Čermák, Czech pioneer and promoter of the five-string banjo. Jiří Tichota recalls his memories on his banjo years and Luboš Malina will take you to a little old-time trip. On almost 300 pages of this book you will find over 400 stylish pictures and photos (many of them have a high historical value). You will hear the ancient stories told by banjo and other traditional instruments, like fiddle, dulcimer or autoharp on the enclosed CD (72 minutes). The whole collection is an outstanding work both by its content and the exceptionally diligent form. „Every man who had set up to follow the footprints of banjo in its foggy past, has experienced the feeling of lonesome traveller in deep dark mountains. But trouble refines souls, fresh air clarifies minds, wandering brings new knowledge. So let’s all set up on the journey. 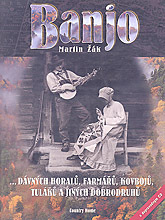 „With his fantastic book Banjo dávných horalů… Martin Žák has paid off a colossal debt of all the banjo players starting from Scruggs to all the old-time fellows who brought banjo to the light of day even before bluegrass. A comprehensive guide for beginner guitar players which will help them to choose their first guitar, strings and other accessories. You will learn to tune your guitar, replace a broken string and other useful skills, but first of all, this guide will lead you from your first easy chords to a stand-alone song accompaniment. On our journey we will slip into Golden Slippers, follow the The Old Chisholm Trail, sit in the Red River Valley, hear the bells Just Before The Battle, be introduced to the infamous Jesse James... We will experience many adventures. You will see not only stylish photos, but also popular drawings of Marko Čermák (draftsman of many comic series and illustrator of books by famous Jaroslav Foglar). A diligently arranged training CD (55 minutes) is also a part of this book. And imagine that you do not have to read sheet music to play the guitar!! „The decision to spend your time with your new girlfriend – a guitar is a lucky decision. I am proud of you. Hold on, don’t be discouraged by initial difficulties. The guitar will reward you later, will become a part of your life and bring much joy not only to you, but also to your friends and acquaintances. I can’t promise you that after mastering contents of this book you will become the greatest guitar player near and far. What I will teach you is primarily how you can use guitar to accompany your singing or chanting of your friend. And I guess that’s the most important thing... Then you can play and sing and spread the good mood. You will be a welcome guest at fireplaces, in camps, in mountain cottage… just about everywhere where people meet and love singing, nature and feeling free at least once a year. I hope you’re glad that I won’t complicate the tutoring with complicated theory, learning to read sheet music and other boring things. Mainly we will just play and sing. No need to read the dots when you want to play the guitar. You may be surprised to hear that many great players can’t read sheet music either. Eleven bluegrass songs with tabs – banjo tabs: Hot Corn, Cold Corn, All the Good Times; mandolin tabs: Salty Dog; dobro tabs: Wabash Cannonball; guitar tabs: Banks of the Ohio etc. 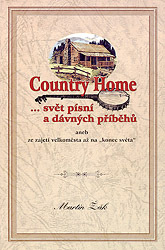 First publication of Country Home – a songbook made with great zest, a true homecraft production. „$25 for every song accepted – this might have been the wording of an advertisement of a recording company in Knoxville, Tennessee in 1920s. Musicians and singers went down from mountains and settled in front of hotels. Recordings from that time show folk music in its pure form, not affected by the city and fashion. The universally acclaimed founder of bluegrass Bill Monroe branched out of this style called hillbilly music or old-time music (the word bluegrass came to use in fifties and was derived from the name of Monroe’s band The Bluegrass Boys). Even devoted fans and musicians differ in the exact definition of bluegrass. What we know is that this style is based on a defined set of string instruments (banjo, fiddle, guitar, bass and mandolin) and prefers high (often lonesome) singing. Gradually the original set of instruments began to widen and the style absorbed many influences. 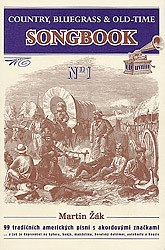 This Songbook includes twenty bluegrass and traditional country songs in English, sixteen of them have also got Czech lyrics. Every song is supplemented with standard sheet music and chords, you will also find here five tab sheets for five-string banjo, a summary of the most common finger positions when playing the guitar, mandolin and banjo, a lot of photos etc. „Don’t hesitate, come closer and sit down by the fire, now it’s the right time to forget all problems and let old stories carry you away. Some of them are sentimental and so sad they will bring you to tears, other will make you smile or dance instantly. If you have your instrument ready, that’s good. You can’t play any instrument? That doesn’t matter, everyone can at least sing. No worries about your singing. What kind of old-time mountaineers would every care about that? They used to have other trouble and singing always helped them overcome them.